The demand for retail-style healthcare has EZ Vet Station thinking “inside the box”. The current focus on innovative solutions and concepts to deliver affordable, convenient and quality medical care has never been greater, and that extends to the pet care industry as well. Answering this growing demand is EZ Vet Station, LLC which has opened another location for their “mini-clinic” style veterinary pet care stations. Their newest location inside the Pet Supplies Plus store in Clearwater, Florida offers evening and weekend hours and walk-in appointments. The emergence of “retail healthcare”, offering medical care services inside a retail environment, is a concept that is quickly expanding in the human health care arena. EZ Vet plans to extend this convenient and affordable health care model into the pet industry. EZ Vet Pet Care Stations are non- emergency compact “kiosk-style” veterinary clinics staffed with licensed Veterinarians and vet assistants that can diagnose and treat a wide variety of pet medical conditions related to teeth, ears, skin, eyes, weight, digestion, diet and parasites, in addition to offering routine services such as vaccines and microchipping. EZ Vet Stations offer a wide range of diagnostic and preventive pet care services designed to keep pets healthy. Consistent with the “mini-clinic” concept they do not offer surgery or emergency care. 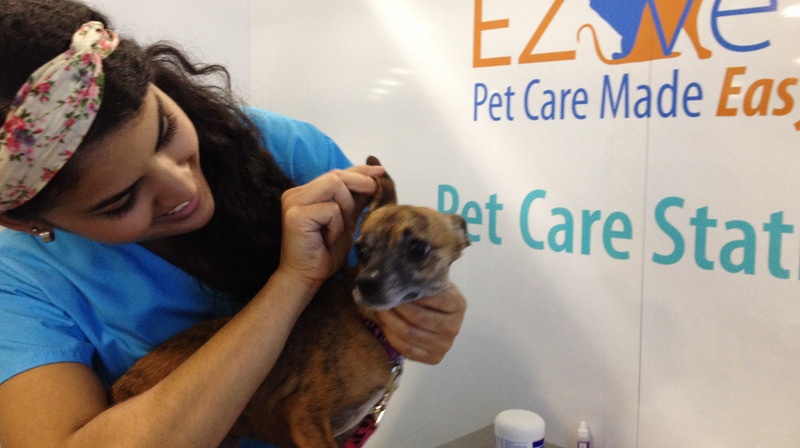 The EZ Vet Station in Clearwater is the second station in Florida, the first located in the Pet Supplies Plus store in Pinellas Park, Florida. EZ Vet Station’s tag line is Save time! Save Money! They support this motto by offering affordable vaccinations, examinations and diagnostic fees inside the neighborhood pet store. They offer Wellness packages that include annual pet vaccinations, heart worm test, intestinal parasite test and preventive (round/hook worm) at reduced prices. Save time with walk-in visits and online appointment scheduling options. EZ Vet Station’s successful launch has clients begging for more prompting a recent announcement of plans to expand into other communities across the nation. Share the post "EZ Vet Station “Mini-Clinics” Provide Convenient And Affordable Pet Care"
Previous PostAre you a Pet Owner or a Pet Parent? Warning! Is your pet obese or overweight?